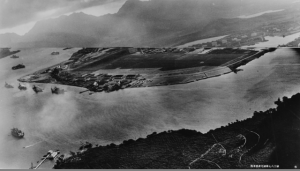 75 years ago, the Japanese Air Force attacked Pearl Harbor in Hawaii. The attack was by 352 aircraft, in two waves, and, was amazingly successful. 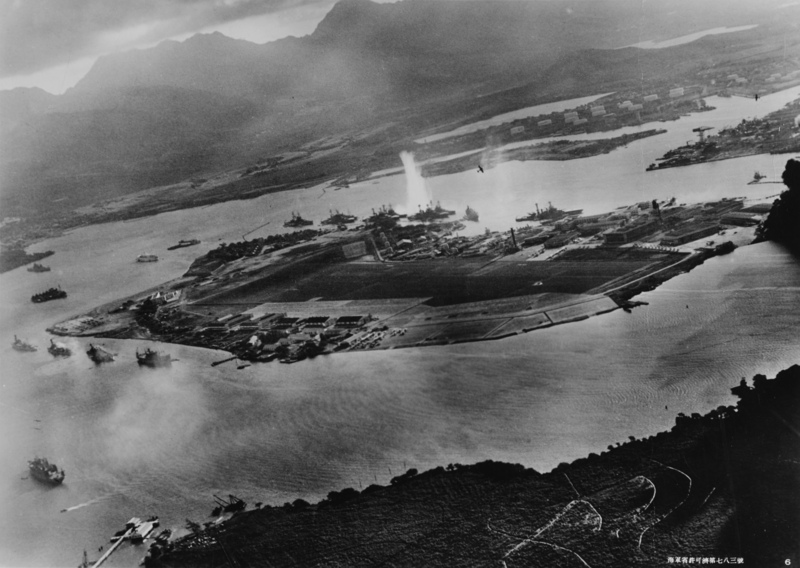 Their goals were to destroy as many of the warships in the harbor as was possible, kill as many military personnel as possible, and demonstrate to America that we were not the superior force in the Pacific. They were partially successful, in that the attack damaged or destroyed 20 ships, killed a couple thousand military folks, and wounded another 1000 folks. However, the end result was NOT successful. By demonstrating their military prowess, the Japanese hoped to keep America from joining in the growing World War. Their attack did just the opposite, as it generated enough support for Roosevelt that it was trivial for him to get a declaration of war through Congress in short order. This attack lead, directly, to a curtain of chaos and madness engulfing the world, killing millions of youth, destroying everything from simple cottages that were the homes of good people, to archeological treasures, to great cities, culminating in the ONE time that Nuclear weapons have been used in conflict. The scars of this event persist today, 75 years later. The U.S.S. Arizona is a permanent memorial in the waters of Pearl Harbor. It is visited by millions every year. Some of those visitors are there because it is a classic tourist destination, and their tour group is scheduled to stand on the bridge over the resting place of the great ship and its crew. Some of those visitors are there to crow over the success of one side inflicting terrible wounds on the other side. Some of these visitors are there because their family members went down with the ship, and it is their final resting place. They have come to weep over the loss, and to remember the grandfather who never came home. Some are on the bridge to contemplate the evils of war, and, of the bigotry, racism, hate, and greed that drives mankind to it…and to ask the question “What can we do to keep this from happening again?”. If you were standing on the bridge over the Arizona, what would YOU be thinking about? Earlier today, I heard a short interview with a survivor of the attack on Pearl Harbor. He was a Navy man, and, ended up near the Oklahoma (which had taken several bomb hits and rolled during the attack). He told of being near the hull of the ship, and hearing the survivors inside, banging on the hull. They were trying to get attention, so they could be located and rescued. The chaos was so overwhelming, though, that it took several days for crews with cutting torches to get to the ship. During that time, the banging got weaker and weaker, and there were fewer and fewer hits echoing out, as the trapped survivors succumbed to CO2 poisoning and died. By the time the rescuers were able to cut into the hull, and make an entrance, most, if not all, of the crew trapped in these compartments were dead. They had spend their final hours in total darkness, partially submerged in water, breathing air that slowly became death, not life. This man, who is 93 years old this year, was heading back to Pearl Harbor, perhaps for one last time, to take part in memorial services. His family said that he had carried those dark images with him for decades, and never spoken of them, until last year when he finally opened up and started talking about the attack and its aftermath. We all have events in our lives that leave deep scars – the loss of a companion animal, the death of a friend, the death of a parent, and the like. 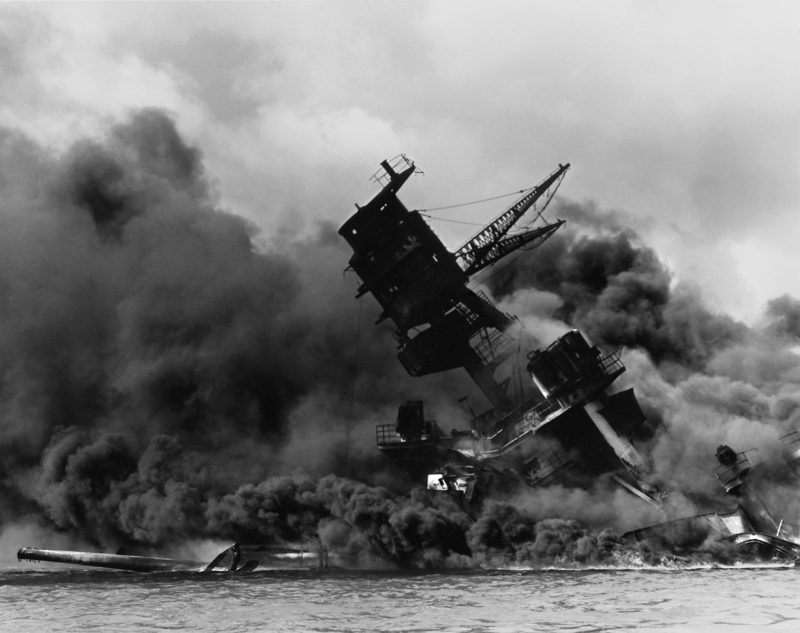 I am sure that there are nights when we lay in bed, surrounded by darkness, and relive that moment when the trauma happened…Those moments are hard to revisit, but, I cannot comprehend living with memories such as were left by the attack on Pearl Harbor, and remaining sane. I am very glad that he, and the other old guard who are finally talking about their dark experiences with others are able to do so. I hope it will bring them some peace, and heal some of the old wounds that they have carried for so long. In closing, I hope everyone that reads this will take a minute or two, and contemplate the evils that mankind is prone to engage in. Learn from this moment in history. Be vigilant about how we are treating each other…and work to focus on respect for others, not demonization. Honor those who have fallen while fighting for principles they believed in. If YOU are a veteran with dark memories, do not repress them forever. You have friends, from both the civilian and military worlds, who can and will share your burden. They will not condemn or judge…but will support and help you deal with those festering wounds. This entry was posted in Ethics, General, Humanity, Nuttiness, Politics and tagged arizona, civil discourse, memories, pearl harbor day, war. Bookmark the permalink.